Concentrated working stress of a corrosion pit is known to be an important factor inducing the deterioration and consequently the breakage of a buried pipe. 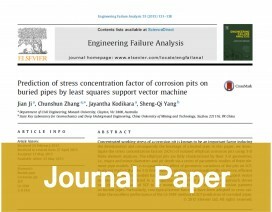 In this paper, we investigate the stress concentration factors (SCFs) of isolated elliptical corrosion pits using 3-D finite element analyses. The elliptical pits are fully characterized by their 3-D geometries, i.e., major and minor diameters and pit depth via a series of parametric studies of finite element pipe models. This is to quantify the effect of geometric variations of the pits on SCF. Realizing the fact that the 3-D finite element analysis is computationally intensive, efficient statistically predictive models have been developed based on least squares support vector machine (LS-SVM) realized in a ubiquitous spreadsheet platform. This approach shows very close predictions of SCF to the numerical findings for elliptical corrosion patterns on buried pipes. Particularly, two typical kernel functions have been adopted to cross validate the excellent performance of the LS-SVM method in SCF prediction of corroded pipes.